Italy's government on Friday launched a formal procedure aimed at revoking concessions held by Autostrade per l'Italia to operate toll highways after a bridge it managed collapsed this week, killing at least 38 people. "Today the government ... has formally sent to Autostrade per l'Italia the letter of complaint which launches the process for revoking the concession," Conte said in a statement. The statement said the disaster was the fault of the company which "had the obligation to look after the ordinary and extraordinary maintenance of the motorway". It added that Autostrade now had 15 days to present its counter-arguments. Matteo Salvini, deputy prime minister and head of the right-wing League party that governs with the 5-Star Movement, said the procedure for revoking the licence would take "weeks or months". [post_ads]Some sector experts estimate that if it revokes the concession the government will have to pay Autostrade up to 20 billion euros ($22.85 billion) in compensation for investments the firm has made, though the government denies this. 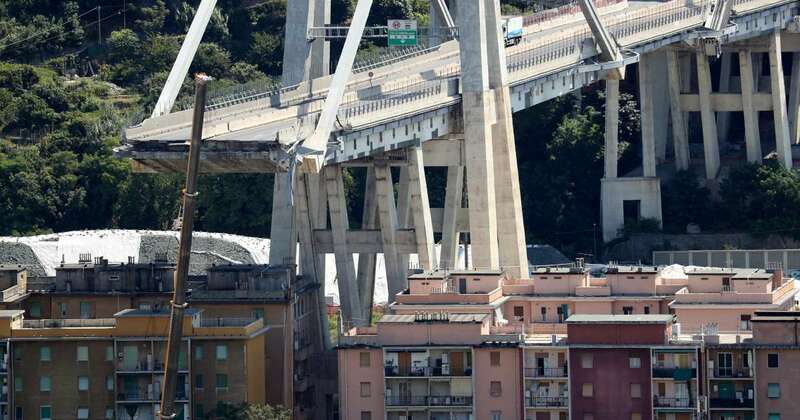 Shares in Atlantia , parent company of Autostrade, plunged more than 30 percent after the bridge collapse in Genoa on Tuesday, but recovered somewhat on Friday, closing up 5.7 percent. Conte said that from now on the government would compel holders of concessions in all Italy's creaking infrastructures to invest more of their profits in maintenance and safety. "This disaster obliges us to take new initiatives which are far more rigorous than those contemplated by previous administrations," he said. An engineering study commissioned by Autostrade last year warned about the condition of the stays, said Carmelo Gentile, a professor from Milan's Polytechnic university who was on the team that carried it out. "The rupture of a cable stay is a serious working hypothesis," Brencich said. "There are witnesses and videos that point in that direction." Autostrade has said it monitored the bridge on a quarterly basis, as required by law, and carried out additional checks by hiring external experts. It had no immediate comment on Friday's reports about problems with the stays. "We are trying to find points where we can penetrate these incredibly heavy slabs. Then the earthmoving equipment moves in to create a passageway where the dogs can enter," firefighter Stefano Zanut said at the scene. Rescuers are hoping the large chunks of debris may have created a "triangle of survival" when they fell, where someone could still be alive, he said. A state funeral for many of the victims will be held on Saturday at Genoa's convention centre, led by the city's archbishop, Cardinal Angelo Bagnasco, and attended by President Sergio Mattarella and Conte. "It is something that has touched everyone because we all used the bridge and it could have happened to anyone," Bishop Nicolo Anselmi said after blessing the coffins.